Kingdom Come: Deliverance - First Impressions, Trying to rise above the glitches — GamingWithSwag.com - Dads By Day, Gamers By Night. 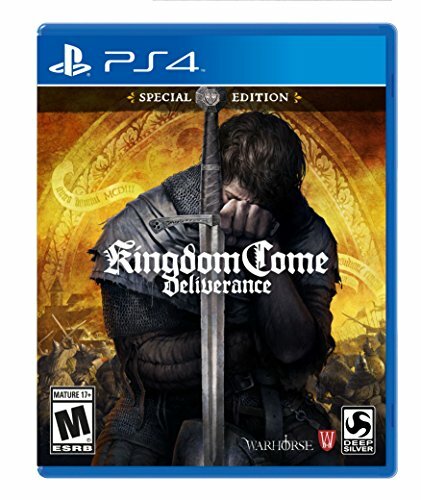 Kingdom Come: Deliverance was a loved kickstarter game born of a desire to make a more realistic RPG where you have to pay attention to your hunger and sleep and navigate more exacting sword fighting and a limited save system. This game isn't for everyone, but for history buffs like me it could be a uniquely amazing experience. So far, I have a love/hate relationship going on with the game, which I am playing on the PS4. We are programmed in other RPGs like Skyrim or The Witcher to save constantly so if we make a mistake we can go back and try again. Well in this game it autosaves on occasion like after cut-scenes and when you sleep in your bed but for long stretches you are on your own and if you want to save you have to drink a special liquor which is prohibitively expensive at least at the beginning of the game. I have been playing for several hours and still couldn't afford to buy one, so I am being very stingy about the few I got in the beginning. This means you will fail at things and have to eat it, which raises the stakes and I haven't gotten used to it yet. Plus the game can have a glitch that traps you until you restart, like one time I went into a room and a maid came in after me and closed the door and just like that I was trapped forever. Another choice contrary to RPG training is looting, if you touch a dead body it hurts your reputation, potentially to the point that you have to bribe people to even talk to you. Not scooping up everything of value from the fallen is tough. The game also has some clunky controls like shooting the bow and arrow is almost a joke of poor design. My most recent glitch was when I was walking through town waiting for the stores to open when a guy ran off accusing me of being a thief which ruined my reputation in a town I had just stepped foot in and would cost me all of my money to pay the fine so I had to go back a save and lose a ton of time invested journeying to this new town. I also discovered through some research that those of us who bought the game on the day of release one of our cities is broken and no one will open the gate for you, so all the remaining quests in there are blocked including one of the potential romantic storylines. I would have to start over from the beginning so I start with the latest patch in place to get it fixed. Those kind of horrendous errors would be a dealbreaker for many, and honestly I can't fault you. Apparently, the can deliver PC patches more quickly but those like me on console have to suffer and wait. However, despite the few flaws this game is enthralling. Almost every challenge in the game has multiple paths to complete them from the violent, to the clever, to the patient. This is the truest and most grounded RPG I have ever played which makes the choices, rewards, and stakes all the more satisfying. Not everyone can get past the flaws, but for those that do this game is thoroughly amazing. Even just walking around taking in the scenery could be worth the price of admission. For those on the fence, I recommend waiting until you hear that the patches have gotten the game under control. It is not under control now.